I thoroughly enjoyed making these haunted pumpkin cookies. They were fairly quick and I am pretty happy with the results. :) I fashioned them after some carved pumpkins that I spotted in the October issue of Country Living magazine, and knew right away that they'd make awesome cookies! With the orange tinted cookie dough, there was no waiting for the first layer of icing to dry, which is especially needed when black icing is going on top. I simply had to let the cookies cool, add the royal icing details and that was it! Spooky cookies in no time flat! 1. Make cookie dough and tint with orange gel coloring. 2. Roll out dough and cut out cookies with pumpkin cutter; place on baking sheet. 3. 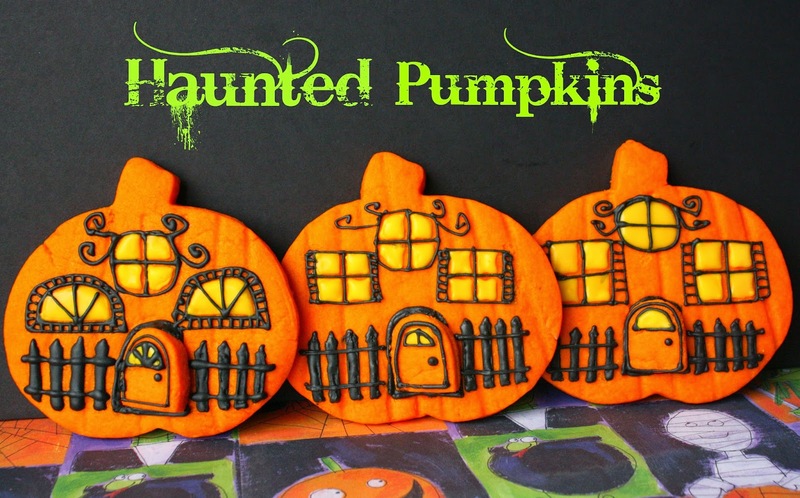 Place the front door template on pumpkin and using a sharp knife, cut out doors and place on baking sheet. 4. Press lollipop stick onto each cookie vertically, spacing and moving across the entire pumpkin. 5. Place cookies in the freezer for 10-15 minutes to help keep the shape and imprint. 6. Bake according to recipe. 7. Tint some royal icing black and with a #1 or #2 tip, add windows, shutters, fence, etc...also decorate the separate doors. 8. After the black has dried a bit, fill in the windows with the yellow. 9. Use some of the black royal icing and apply it to the door frame. Add the door (ajar) to the door frame. !0. Let cookie dry completely. Hi Sue! From Quinn, "Those are so cool!" :) Really fun and creative, as always! I love the designs. These would be so cool to have at my pumpkin carving party this year. These are so adorable and festive, Sue. So bright, and wickedly cute! I love the way you tinted the dough! They are wonderful! Pinning now! You are amazing! These cookies are wonderful! They are perfect for a Halloween party.